Some 22km east of the city, Skopje International Airport is small and easy to use. After disembarking and entering the main terminal building, follow the signs until you reach passport control where you’ll be confronted with a row of booths currently offering four options, namely All Passports, Citizens, MK Citizens and EU Citizens. Once you’ve figured out who you are, passport checks are generally relaxed and friendly. The Arrivals and Departures halls are in the same building and share a range of facilities including ATMs, currency exchange, information desk, car rental booths and a café. There’s also a small shop selling a range of useful things including maps, sunglasses and umbrellas. Getting to town A taxi to the city centre should cost around 900den or €15 (payable in either currency) and the journey takes less than 30 minutes. To the right of the exit, the Manora shuttle bus (www.manoragroup.com) leaves approximately 12 times a day. The fare is currently 190den and the bus stops at Capitol Mall, the bus/train station and the Holiday Inn hotel right in the centre of the city. Note that on busy days you might not be able to get a seat straight away, and so it’s advisable to buy a ticket from the kiosk inside. 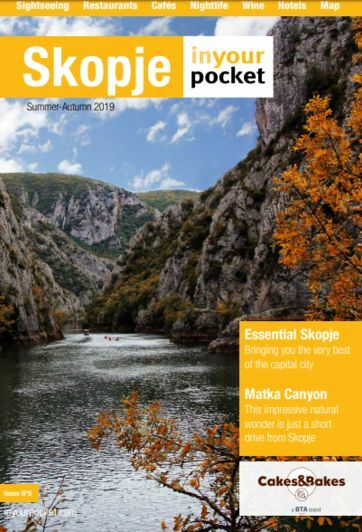 Arriving in Skopje by car can be stressful and confusing for first-timers, especially for those who’ve never experienced the miscellaneous idiosyncrasies of Balkan-style driving. Although major signs are written in both Cyrillic and Latin, there are few visual hints as to what might be the city centre, and the somewhat bewildering system of one-way streets only adds to the pandemonium. The arrival of Sat Nav has drastically improved matters, and if you’re arriving in a rental car it’s worth checking to make sure it’s equipped with one. A couple of highways leading into the city require a small toll fee which can be paid in either local currency or euros. Macedonian toll booths now also accept credit cards. All international and long-distance buses arrive at Skopje’s reasonably central bus station just east of the city centre on the southern side of the river. Inside, find ATMs, a couple of small shops selling sweets, drinks and cigarettes and a handful of windows and kiosks for buying onward tickets. Getting to town It’s possible to walk to the city centre in about 15 minutes, or take bus N°3, 5, 15, 15a, 23, 27, which runs along Bul. Kuzman Josifovski Pitu. Taxis (and taxi drivers) can be found congregating outside the main entrance/exit. A ride into the centre shouldn’t cost more than 100den. Negotiate a price before getting in the vehicle. All trains arrive at Skopje’s one and only train station, an interesting concrete construction designed by the Japanese architect Kenzō Tange to replace the building destroyed by the 1963 earthquake. Sadly in a state of serious disrepair and containing almost nothing in the way of facilities, if you need money, drink, food or cigarettes you’ll need to use the services at the adjoining bus station. The connecting door between the two is often locked, in which case it’s necessary to leave via the main exit and snake left around the building. Getting to town See Arriving by bus (above).